Football is fun! It’s exciting, it brings us together… to share, to enjoy, to be proud (or ashamed?) of our favorite teams. Simply put, it creates a spirit of community. And we at AVAST Software realize how important community is. We also know that AVAST has a community of 22,000,000 users in Brazil. Given the fact that Brazil has 200,000,000 inhabitants, shall we say that AVAST protects every 10th football fan in Brazil? 1. 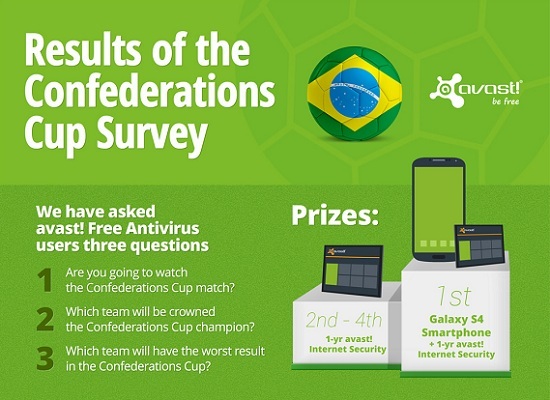 Are you going to watch the Confederations Cup match? 2. Which team will be crowned the Confederations Cup champion? 3. Which team will have the worst result in the Confederations Cup? Following users are awarded for participating and predicting correct results as first. Congratulations to the winners, we will contact you via email! Now, see how the survey engaged AVAST users and how participants actually responded!